Our mashup Photos from Twitter got a mobile version: http://localphoto.linkstore.ru (is is a mobile site). Lets you see local photos as well as search them by keywords. This mobile web application works on Android, iPhone and S60 phones. А new version of Java Servlets Office Suite (the largest collection of Java servlets and filters) is ready. Check out JSOS 6.75 here. 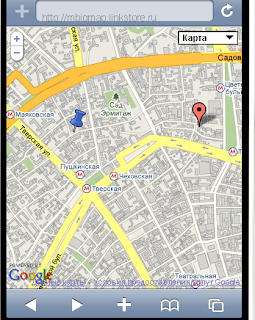 "This mobile application has one simple but effective feature, it allows you to save a location in Google Maps. So for example, when you park your car you can find your way back to it's exact location. Or, imagine you have checked into a hotel in an unfamiliar city, you can store the hotel's location and always be able to find your way back no matter where you wander." - our mashup Mobile maps on Google Maps Mania. Web-control lets you work with Twitter right from JSP code - Twitter taglib. Our5 own server-side Twitter mashups (e.g. Twitter 411) use this component. A new open source web application security hole scanner is available from Google. The tool, named Skipfish, allows web developers to test their applications for possible vulnerabilities. Skipfish can be used to determine if code is vulnerable to common attacks such as cross-site scripting (XSS), SQL, and XML injection attacks. See it here. Our US partner OMOLI, Inc provides a store for components in Coldtags suite here. So, if this sales channel is more convenient for you than you are welcome. We do support all customers. Data models in Apache Cassandra. NoSQL is really hot topic. Would you like to see NoSQL components in our Coldtags suite? 2. Set the place (location) you need and hit on the marker. You will see an information window lets you create a new map with the saved location. Link email lets you send that new map by email (you can send to your own address too by the way), sms link lets you share your map via SMS (of course, if your phone does support it, like S60 platform for example) and link will simply open a new map in your mobile browser (it is the most convenient way for this task - just save the map in your bookmarks). 3. After that, any time later when that page is opened you will see two markers on it - saved location and your current location. Yet another way for setting RSS on mobile - mobilerss. P.S. Our own mobilizers currently use transcoding from Google. See for example Mobile pages and QR-code maker. jQuery plugins lets you add a lot of features to old HTML tables. 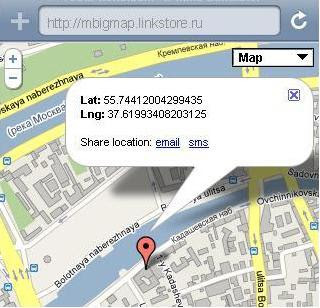 MyMaps for mobile mashup: http://mymap.linkstore.ru (it is a mobile link). 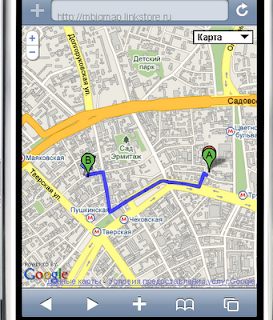 Lets you create maps right on the mobile (iPhone, Android, S60). No registration required. Just set a location, get unique link to your map and bookmark it in your browser. Also you can share created maps with friends/partners (email, SMS, Facebook, Google Buzz). For example, the simplest use case: bookmark your car parking location and find your car easily. Our directory of mashups has been updated. Check out for example a new MyMap mashup - mobile (iPhone, Android, S60) maps mashup lets you create and share maps right from mobile. 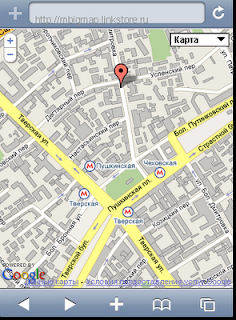 Geo-coding services from Google have been updated. 2500 requests per day, XML and JSON. And no more developers keys by the way. And here you can see custom JSP taglib for geocoding. And it is not only for Google. See more here. For example, our mashup Geo Trace uses them. LAMP, an acronym for Linux Apache MySQL PHP, happens to be most common server side solution stack. CUMP i is an acronym for Cherokee Ubuntu MariaDB PHP. It seems to be a very promising contender in becoming the popular solution stack of the future. Coldtags suite reaches ver. 3.90. This suite provides 390+ custom taglibs for JSP (and/or Coldfusion) developers. Among the others updates check out updated Ajax components. For example a new JSONP component. "There are a lot of interesting links shared in Twitter accounts that you miss out on because of all the clutter, especially if you are following a lot of people. Going through all the tweets to find those links can be tedious. Links in Twitter is a Twitter mashup that allows you to view the links that have been posted on a specific user’s account plus his friends’ account. With this app you can browse recent links posted in Twitter’s timeline." - our mashup Links in Twitter on MakeUseOf site. Sweet HTML5 future: record audio files right in browser. Flash caput? Our GeoPost mashup has been updated. Idea is very simple. Many modern blog platforms (most of them actually) let you publish data by email. You can just send email to some service address and platform transforms it into a new post. For example, in Posterous you can send data to post@your_blog.posterours.com, in Friendfeed it is share@friendfeed.com, in Blogger you can set address in Settings->Email&Mobile tab etc. 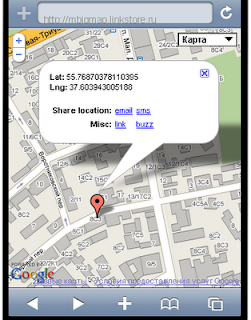 And our mashup Geo posts lets you create a personalized mobile web application for posting geo related data to your blog. Just set a service email address in the form below and get a link to mobile web application for iPhone, Android or S60 platform. This web application lets you email new postings right from the map - just click on the draggable marker that presents your location. And application automatically adds to email a link to the location. So your posts will have a direct link to some map. It is probably the easiest way for sharing locations, write about some check-ins, lets your readers to see the place you are writing about etc. Also you can create with this mashup your own emergency communication tool. You can predefine not only email address for sending your location but a phone number for SMS too. So you will be able to share your location via email/sms just in one click. Mashup creates a personal link for your geo-sharing application as well as QR code for loading this link right into your mobile. For gmail users mashup supports Google Buzz posting too. "A wireframe in essence, is a visual representation, guide, and basic element structure of a websites interface design. Wireframes are usually the product of an idea that’s later reproduced on paper (or screen) so that they can preserve and maintain the consistency of visual similarities throughout a websites design. Not only that, but wireframing allows us to save valuable time and money. Deciding to create a website without planning, many times results in a very poorly functional interface. This will ultimately drive users away from your website, and tarnish the quality of your brand." - a very useful collection of prototyping services. Ajax control for JSP (and/or Coldfusion) in Ruby_on_Rails style: Link to remote. "The ACID RDBMS isn’t appropriate for every need, nor is the NoSQL solution. A social media site is not an inventory system. A banking account management system is not a social news aggregator." - from here. More than reasonable remarks about NoSQL buzz. What is else? You can share this mobile page with your friend right from the mobile (email, sms). You can add files to your page, so they will become downloadable right from that page. Actually you can even use this tool just for sharing your files. During the mobile page generation mashup automatically proceeds links in the text. You can even add mobile transcoding to the links make content available via mobiles. Another interesting option is one time readable pages. You can create a page (or downloadable content) that will be destroyed after the first reading. So this option could be used for premium content for example. IT in job trends. JSP is still alive, JSF is still dead. P.S. have you seen the latest version of Coldtags suite? From a performance perspective, the trouble with cookies is that once the server sets a cookie for a particular domain, all subsequent HTTP requests for that domain must include the cookie. Even if the server has no use for the cookie, as is usually the case with static components, the cookie is sent over the wire anyway, bloating our request headers with useless code. So serving static content (e.g. images, css etc.) from a cookieless domain is a standard performance best practice. See more details here. And JSOS provides several components lets you share your content across several servers. See for example: Load balance and Moved permanently servlets.